El aneurisma de la aorta abdominal es muy frecuente en nuestro medio y a nivel mundial, por lo que debe conocerse el manejo anestésico y sus implicaciones a largo plazo. Objetivo: comparar las técnicas anestésicas en pacientes con aneurisma de aorta abdominal llevados a reparación con prótesis endovascular entre enero 2009 a enero 2015 en el Hospital de San José de Bogotá. 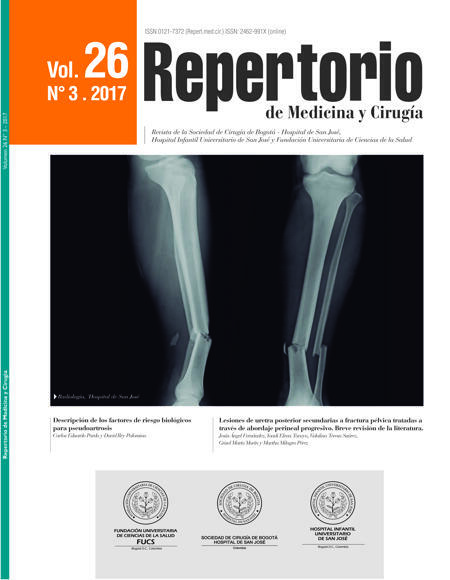 Métodos: estudio descriptivo retrospectivo de pacientes mayores de 18 años con aneurisma de aorta abdominal corregidos (EVAR) con prótesis endovascular excluyendo los rotos, los practicados de urgencia o con corrección de manera abierta. Resultados: de 79 reparos endovasculares (EVARs) 58 (73,4%) fueron en hombres, los antecedentes más observados fueron hipertensión arterial (68,3%), enfermedad pulmonar obstructiva crónica (20,2%) y consumo de tabaco (15,1%). La técnica más utilizada fue anestesia local más sedación (50,6%), seguida de anestesia general (39,2%) y regional (10,1%); esta última mostró mayor estabilidad hemodinámica, menor requerimiento de vasopresores e inotrópicos. Hubo 33 (41,7%) complicaciones anestésicas. Conclusiones: la anestesia local más sedación fue la técnica más utilizada, con una mayor frecuencia en casos con comorbilidades. El tiempo anestésico y la estadía hospitalaria fue similar a la anestesia general, aunque con menores complicaciones; la regional requirió menor uso de vasopresores e inotrópicos. 1. Riambau V, Guerrero F, Montañá X, Gilabert R. [Abdominal aortic aneurysm and renovascular disease]. Rev Esp Cardiol. 2007;60:639–54. 2. Tay JW, Leong YP. Ruptured abdominal aortic aneurysm treated by endovascular aneurysm repair under local anaesthesia. Med J Malaysia. 2012;67:111–2. 3. Hoel AW. Aneurysmal disease: thoracic aorta. Surg Clin North Am. 2013;93:893–910, ix. 4. Gerassimidis TS, Papazoglou KO, Kamparoudis AG, Konstantinidis K, Karkos CD, Karamanos D, et al. Endovascular management of ruptured abdominal aortic aneurysms: 6-year experience from a Greek center. J Vasc Surg. 2005;42:615–23, discussion 23. 5. Karthikesalingam A, Thrumurthy SG, Young EL, Hinchliffe RJ, Holt PJ, Thompson MM. Locoregional anesthesia for endovascular aneurysm repair. J Vasc Surg. 2012;56:510–9. 6. Ruppert V, Leurs LJ, Steckmeier B, Buth J, Umscheid T. Influence of anesthesia type on outcome after endovascular aortic aneurysm repair: an analysis based on EUROSTAR data. J Vasc Surg. 2006;44:16–21, discussion. 7. Edwards MS, Andrews JS, Edwards AF, Ghanami RJ, Corriere MA, Goodney PP, et al. Results of endovascular aortic aneurysm repair with general, regional, and local/monitored anesthesia care in the American College of Surgeons National Surgical Quality Improvement Program database. J Vasc Surg. 2011;54:1273–82. 8. Lorentz MN, Boni CL, Soares RR. Anesthesia for endovascular surgery of the abdominal aorta. Rev Bras Anestesiol. 2008;58:525–32, 0-5. 9. Ullery BW, Lee JT. Considerations for patients undergoing endovascular abdominal aortic aneurysm repair. Anesthesiol Clin. 2014;32:723–34. 10. Geisbüsch P, Katzen BT, Machado R, Benenati JF, Pena C, Tsoukas AI. Local anaesthesia for endovascular repair of infrarenal aortic aneurysms. Eur J Vasc Endovasc Surg. 2011;42:467–73. 11. Falkensammer J, Hakaim AG, Klocker J, Biebl M, Lau LL, Neuhauser B, et al. Paravertebral blockade with propofol sedation versus general anesthesia for elective endovascular abdominal aortic aneurysm repair. Vascular. 2006;14:17–22. 12. De Virgilio C, Romero L, Donayre C, Meek K, Lewis RJ, Lippmann M, et al. Endovascular abdominal aortic aneurysm repair with general versus local anesthesia: a comparison of cardiopulmonary morbidity and mortality rates. J Vasc Surg. 2002;36:988–91. 13. Brown BJ, Zakhary S, Rogers L, Ellis-Stoll C, Gable D, Ramsay MA. Use of dexmedetomidine versus general anesthesia for endovascular repair of abdominal aortic aneurysms. Proc (Bayl Univ Med Cent). 2006;19:213–5. 14. Huncke TK, Adelman M, Jacobowitz G, Maldonado T, Bekker A. A prospective, randomized, placebo-controlled study evaluating the efficacy of dexmedetomidine for sedation during vascular procedures. Vasc Endovascular Surg. 2010;44:257–61. 15. Broos PP, Stokmans RA, Cuypers PW, van Sambeek MR, Teijink JA, ENGAGE Investigators. Eeffects of anesthesia type on perioperative outcome after endovascular aneurysm repair. J Endovasc Ther. 2015;22:770–7. 16. Machado R, Antunes IL, Oliveira P, Pereira C, Almeida R. Institutional impact of EVAR’s incorporation in the treatment of abdominal aortic aneurysm: a 12 years’ experience analysis. Braz J Cardiovasc Surg. 2016;31:98–105. 17. Verhoeven EL, Cinà CS, Tielliu IF, Zeebregts CJ, Prins TR, Eindhoven GB, et al. Local anesthesia for endovascular abdominal aortic aneurysm repair. J Vasc Surg. 2005;42:402–9. 18. Kothandan H, Haw Chieh GL, Khan SA, Karthekeyan RB, Sharad SS. Anesthetic considerations for endovascular abdominal aortic aneurysm repair. Ann Card Anaesth. 2016;19:132–41. 19. Verhoeven EL, Prins TR, van den Dungen JJ, Tielliu IF, Hulsebos RG, van Schilfgaarde R. Endovascular repair of acute AAAs under local anesthesia with bifurcated endografts: a feasibility study. J Endovasc Ther. 2002;9:729–35. 20. Bettex DA, Lachat M, Pfammatter T, Schmidlin D, Turina MI, Schmid ER. To compare general, epidural and local anaesthesia for endovascular aneurysm repair (EVAR). Eur J Vasc Endovasc Surg. 2001;21:179–84. 21. Parra JR, Crabtree T, McLafferty RB, Ayerdi J, Gruneiro LA, Ramsey DE, et al. Anesthesia technique and outcomes of endovascular aneurysm repair. Ann Vasc Surg. 2005;19:123–9. 22. Boersma E, Kertai MD, Schouten O, Bax JJ, Noordzij P, Steyerberg EW, et al. Perioperative cardiovascular mortality in noncardiac surgery: validation of the Lee cardiac risk index. Am J Med. 2005;118:1134–41. 23. Bakker EJ, van de Luijtgaarden KM, van Lier F, Valentijn TM, Hoeks SE, Klimek M, et al. General anaesthesia is associated with adverse cardiac outcome after endovascular aneurysm repair. Eur J Vasc Endovasc Surg. 2012;44:121–5. 24. Sadat U, Cooper DG, Gillard JH, Walsh SR, Hayes PD. Impact of the type of anesthesia on outcome after elective endovascular aortic aneurysm repair: literature review. Vascular. 2008;16:340–5. 25. Abdallah FW, Adham AM, Chan VW, Kanazi GE. Analgesic benefits of preincisional transversus abdominis plane block for abdominal aortic aneurysm repair. J Cardiothorac Vasc Anesth. 2013;27:536–8.